Can you confirm these amateur observations of Cyrtodactylus varadgirii? Types Holotype: NCBS AQ475, adult male; collected by Prathamesh Ghadekar, 03.02.2012. Paratypes. NCBS AQ191, adult male; same locality and collection data as holotype. CES09/1381, adult male; Chikhli, Navsari District, Gujarat, India; collected by Rohan Nimbalkar, 29.03.2012. CES/09/1368, adult male; Chandrapur District, Maharashtra, India; collected by T. Khichi, 06.04.2012. CES09/1536, adult male and CES09/ 1537, adult female; Amravathi District, Maharashtra, India; collected by Krishna Khan, 26.06.2014. BNHS 1427, adult male; Sanjay Gandhi National Park, Mumbai, Maharashtra, India; collected by A. C. Sekar & V. M. Hegde, 15.09.1993; BNHS 1434, subdadult male; Junagadh District, Gujarat, India; collected by Raju Vyas, 08.11.1997; NCBS AQ192, adult male, BNHS 1848, adult male and BNHS 1849, adult female, Aarey Milk Colony, Mumbai, Maharashtra, India; collected by Zeeshan Mirza and Rajesh Sanap, 26.03.2008, BNHS 1929 subadult female with same collection details as previous specimens, except collected on 04.11.2008; BNHS 2099; adult female; Vansda National Park, Navsari District, Gujarat, India; collected by Raju Vyas, 12.09.2008. CES09/1433, tissue sample only, Chikhli, Navsari District, Gujarat, India. Diagnosis Diagnosis. Cyrtodactylus varadgirii sp. nov. can be distinguished from all congeners by the following characters: adult SVL up to 56.0 mm; homogeneous dorsal scalation of small, rounded, granules; absence of femoral and precloacal pores; precloacal groove absent; 4–6 pairs of spots on body, one pair on the occiput, and five spots on the crown. Cyrtodactylus varadgirii sp. nov. can be differentiated from the Sri Lankan C. yakhuna by dorsal colour pattern (4–6 pairs of spots from behind occiput to between hindlimb insertion, occasionally broken into an extra spot on one side, approximately twice as broad as lighter interspaces vs. one or two rows of spots/ bands, equal to or narrower than interspaces); dorsal scalation (entirely homogeneous vs. presence of few enlarged scales near hind-limbs). The new species is most similar to C. collegalensis and C. speciosus, from which it can be distinguished by a patch of enlarged roughly hexagonal scales on the canthus rostralis and beneath the angle of jaw (vs. the absence of these enlarged scales in both C. collegalensis and C. speciosus); its slightly longer limbs (SVL/ FL 6.12 ± 0.13 vs. 6.46 ± 0.23 in collegalensis and 6.87 ± 0.74 in speciosus, SVL/CL 5.58 ± 0.24, vs. 5.89 ± 0.14 and 5.96 ± 0.08), the eye and ear are closer together than the nostril and eye (EE/NE 0.94 ± 0.09 vs. 1.05 ± 0.07 and 1.09 ± 0.04 in collegalensis and speciosus), the occipital collar (narrowly divided medially and separated from temporal blotch vs. notched or incompletely divided and usually connected to temporal blotch in C. collegalensis vs. complete and contiguous with temporal blotch in C. speciosus), dorsal colour pattern (4–6 pairs of spots from behind occiput to between hindlimb insertion, occasionally broken into an extra spot on one side, lighter interspaces ~1/2 width of bands, no stippling vs. three pairs of dark spots that may be fused into 8-shaped markings from behind occiput to between hindlimb insertion, lighter interspaces smaller than largest spot and larger than smallest, stippled vs. two dark black-edged bands from behind occiput to between hindlimb insertion, lighter interspaces ~1/2 width of bands, little or no stippling in interspaces). Comment Cyrtodactylus varadgirii is the only Geckoella which is not a forest-specialist, and is also found in human-modified landscapes (Fig. 8 in Agarwal et al. 2016). It is also the only known widely distributed species. 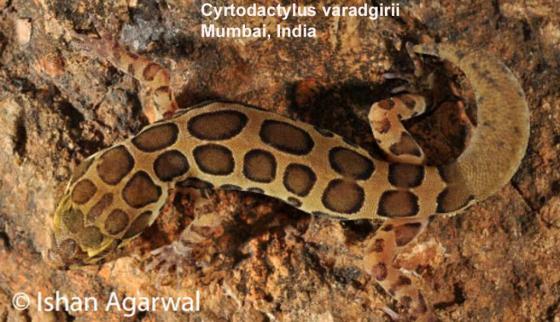 Sympatry: Cyrtodactylus varadgirii broadly overlaps in distribution with the endemic geckos C. deccanensis (Günther), Hemidactylus gracilis Blanford, and H. maculatus Duméril & Bibron; the agamids Sarada deccanensis (Jerdon) and Sitana spinaecephalus Deepak et al; and the snakes Platyceps gracilis (Günther), Coronella brachyura (Günther), and Psammophis longifrons Boulenger. All these species, apart from the Western Ghats forest species C. deccanensis and H. maculatus, live in open, arid landscapes. 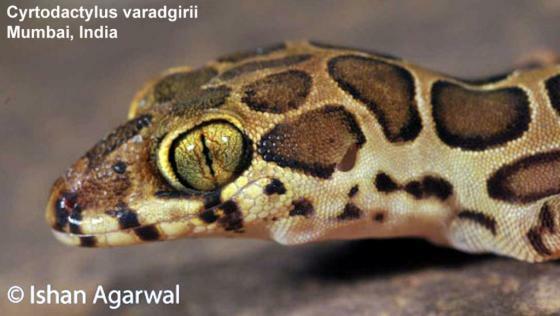 Etymology The specific epithet is a patronym honouring our friend and colleague, Dr. Varad Giri (pronounced vʌrʌð gIri), former Curator of the Bombay Natural History Society, Mumbai (BNHS), for his contributions to Indian herpetology. Most of Varad’s work has come from his time at the BNHS, and it is fitting that the type locality of this species is Mumbai (formerly Bombay).